Sam is going home today! He is eating well and able to control his urination. While he is still unable to stand or walk, he is getting stronger every day. 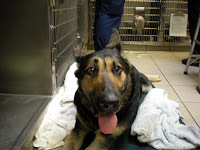 Sam has a long way to go with weeks of physical therapy before he will be able to walk again. He still has no feeling in his left front limb, there is a strong chance he will not regain use of that limb. Caring for Sam is going to be a lot of work for his owners, but I know they are excited to have him home and grateful for all the help he has received. Over $6000 in donations were made to the Sam Moreno Fund at Friendship. The majority of this money was used to cover his hospitalization, daily physical exams, nursing care and medications. Friendship also donated a portion of the fund to Dr. Bush's BVNS Rascal Foundation who covered the cost of Sam's CT scan and MRI. Dr. Covert who cared for Sam during his first five days in the hospital and drove him out to Leesburg to see Dr. Bush should be commended on her dedication to seeing him through this taxing ordeal. His technicians did a wonderful job of keeping him comfortable and making sure he had everything he needed while in the hospital. The outpouring of donations and well wishes from members of the community illustrate how much we love our dogs. Thank you to everyone who helped in getting Sam back to his family. Thank you to everyone who has offered support (financial and otherwise) for Sam. Sam's family informed us that Sam died peacefully and suddenly at home early this (Friday) morning. As Dr. Hughes' post from yesterday indicates, he had been doing quite well in the hospital and certainly seemed to be anxious to go home. His owners were anxious to have him at home. The cause of his death is unknown but the acuteness of his demise would indicate a vascular event such as a pulmonary embolism. I want to thank everyone who provided support for Sam - the doctors and technicians here at Friendship and the enitire dog loving community. It is a sad ending to the story but I think that we can be heartened by the way the community came together to help Sam and that he was, if ever so briefly, able to go home after some very severe injuries.